Three great friends change the history of aviation. One of them will also touch the lives of millions of readers with The Little Prince. France in the 1920s. Only the best pilots are given jobs at Latécoère. The successful candidates include Jean Mermoz, Henri Guillaumet and Antoine de Saint-Exupéry, three heroic aviators who will pioneer new mail routes across the world. No distance is too far and no mountain too high: the letters must reach their destination. Back on solid ground, they must deal with the troubles they encounter during a century torn apart by war. A cielo abierto portrays the incredible feats of three great friends who changed the history of aviation and also pays homage to the author of The Little Prince, an unforgettable writer who saw the world through a child’s eyes. 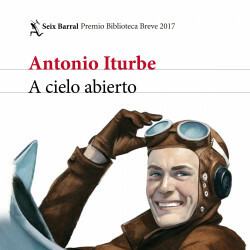 Antonio Iturbe has written a thrilling novel that keeps a masterful balance between the exciting action and subtle emotions inspired by Saint-Exupéry’s view of the world. The characters are perfectly drawn and the settings range from Parisian salons and New York literary circles to the universe that surrounded these legendary aviators. This is a celebration of the essence of literature in a tale of friendship, impossible dreams, love and passion, the pleasure of flight and the discovery, from the air, of a beautiful, mysterious planet. Planeta Manuscrito (Portugal), Akropolis (Czech Republic), RAO Books (Romania), DeA Libri Planeta (Italy). Henry Holt (USA), Pegasus (Turkey).